AGBU Alexander Primary School - Blog: Debating News: ANOTHER VICTORIOUS DEBATE! 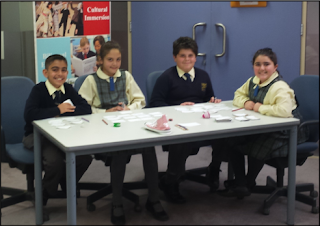 On Wednesday, May 20 the Sydney Japanese School hosted the second debate for the Interschool Debating Competition. The topic was “We should all buy Australian grown food”. Alexander Primary was the negative and our opponents were the John Colet School as the affirmative. The negative team consisted of Taniel as first speaker, Tzolare as second speaker, Matthew as third and Talia was fourth speakers. Taniel started his case by defining the topic and putting forward a strong case line that “We should have the choice to decide”. He used strong arguments as to why we need to import food and outlined many reasons from economic to availability of the product and very simply for having the freedom of choice. Second speaker Tzolare was there ready to rebut many of the points that the affirmative team put forward and she did this with ease. She went on to inform us about the benefits of imports and the negative environmental effects of farming and grazing in Australia. She argued that international trade is responsible for much of the development and prosperity of the modern world. By also stating that trade increases competition and lowers world prices she deduced quality of foods is likely to increase as competition encourages us to make our products better. Matthew, our third speaker came out strong and was able to rebut everything the opposition had said and summed up his team’s case. Talia was our fourth speaker. Her role was to help with any rebuts if needed and to thank the other team for a very challenging debate. Both teams had strong speakers and had researched the topic well to present excellent arguments. It was very closely fought, with our team coming up with the win in the end. Well done debaters!